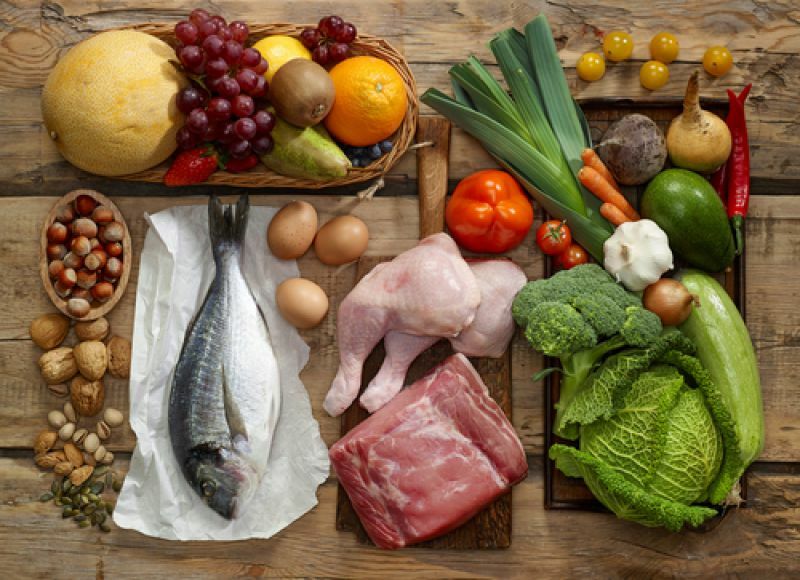 According to proponents of the Paleolithic diet, including some medical experts and celebrities like Gwyneth Paltrow, we should be eating like our caveman ancestors. The theory goes that our digestive systems have not evolved to cope with the modern diet, loaded as it is with low-fibre, high fat, high sugar and highly processed foods. Combined with our sedentary lifestyles, some nutritionists believe that many of the foods we eat nowadays are a major factor in leading to adverse health conditions such as heart disease, type 2 diabetes and obesity. 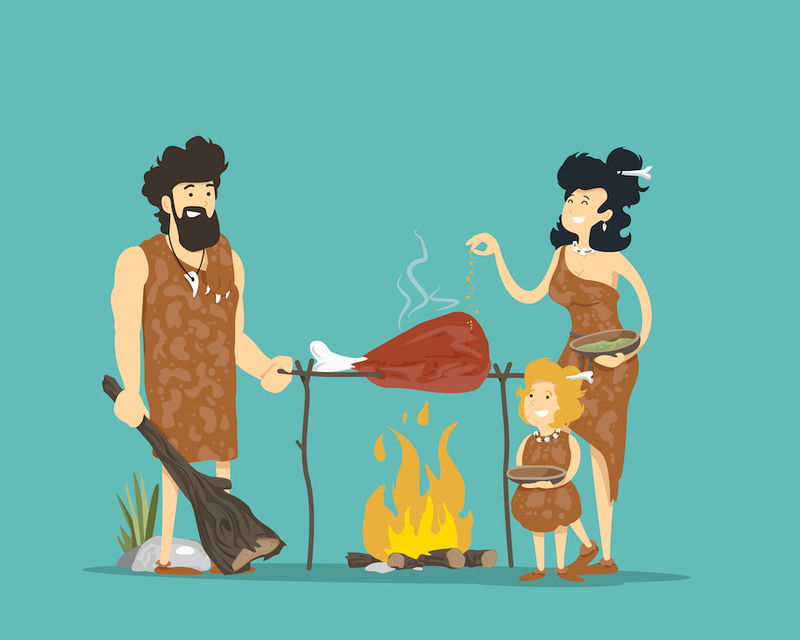 But before you emulate Fred Flintstone, grab your club and run off to catch yourself a mammoth, it might be interesting to consider the pros and cons of the Paleo diet and what eating like our early ancestors actually entails. • Eat more protein, including lean meat and fish. He believes that this should comprise 20% of the diet, as opposed to the 15% in the average western diet today. • Eat more slowly digested fruit and vegetables with a low glycaemic index, rather than starchy carbohydrates, which may cause a spike in blood sugar levels. • Eat more fibre, not from whole-grains, but from unpeeled fruit and vegetables. • Eat healthy Omega 3 fats, found in meat, and cut out the trans fats and polyunsaturated fats in modern margarines and spreads. • Reduce your salt intake. • Try to eat unprocessed foods and raw foods. 1. Whole grains, such as wheat, oats and rice are excluded. These are important foods that give us energy and provide fibre for gut health. 2. Beans and pulses are excluded. For vegetarians, these provide essential protein, so they would find this diet very hard to follow, never mind the fact that the paleo diet involves eating lots of meat and fish. 3. Eliminating whole food groups means that many essential nutrients, vitamins and minerals are missing from the diet. 4. The exclusion of milk and dairy products risks inadequate consumption of calcium, leading to brittle bones and tooth decay. 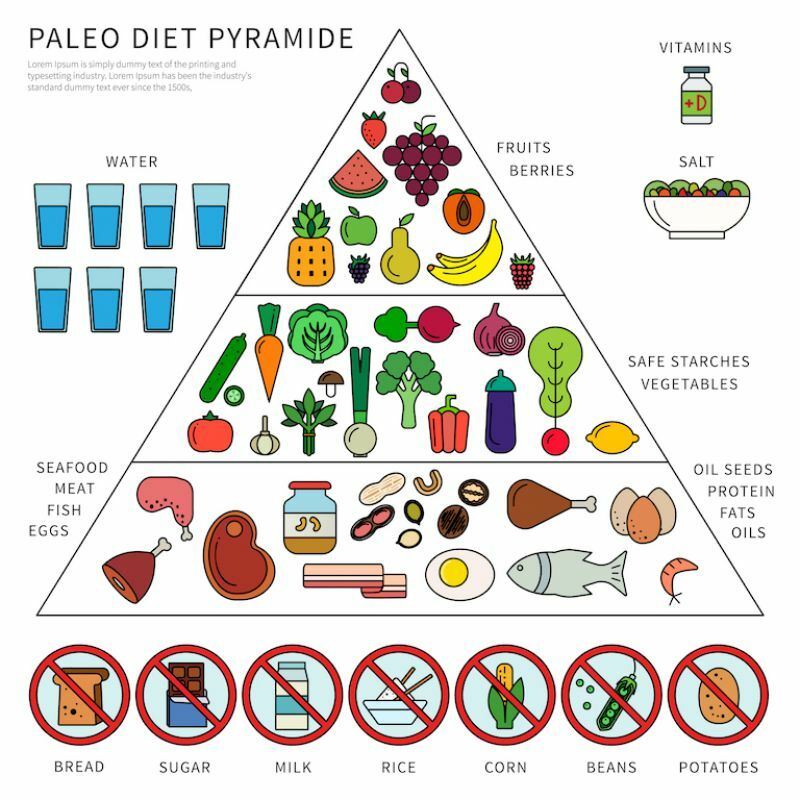 Although the paleo diet advocates eating many foods that are considered healthy and beneficial today, it also excludes other major food groups that are believed to be equally essential to good health, and does not therefore conform to what is considered to constitute “healthy eating” in the opinion of most experts. • Base our meals on starchy foods like bread, pasta and rice, choosing whole grains where possible. • Eat a moderate amount of protein in the form of meat, oily fish or pulses. • Cut down on sugar and salt. • Eat plenty of fibre.